One hot superfruit right now is the goji berry. These bright red-orange fruits grow on arching stems of a deciduous shrub. They could be the perfect shrub for you if you are located in Zones 6-9. This shrub is classified as Lycium barbarum and is included within the Solanaceae family. Familiar cousins include tomatoes, peppers, eggplant, and tobacco. In addition to goji berry or just goji, this shrub is also known as the wolfberry, barbary matrimony vine, box thorn, Himalayan goji, Chinese boxthorn, matrimony vine, or Duke of Argyll's tea tree. This species is best suited for growing in USDA Zones 6 through 9. It is native to China. Lycium barbarum can be up to 10 feet tall and a few feet wider due to the arching nature of the branches, forming into an oval shape. For the best flowering and fruiting, place in a location where it will receive full sun. It can also tolerate some shade as needed. 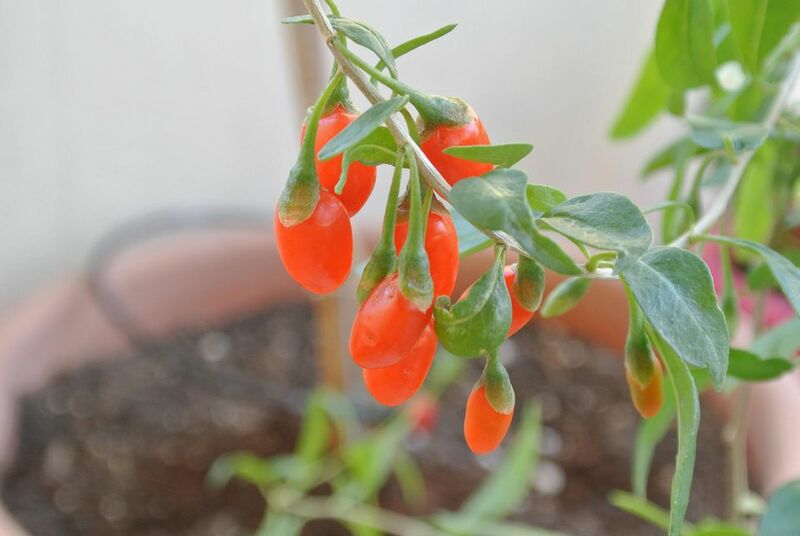 Goji plants are usually small enough to be easily grown in containers on your patio or balcony. These shrubs can be propagated by seed germination or rooting cuttings. The green leaves can be shaped like eggs or lances. In temperate areas, they will be deciduous. The foliage can be steeped to make a tea. The lovely purple or lavender blossoms are formed either singularly or in small clusters. Each red-orange oval berry is up to 3/4 inch long. They will keep producing fruit throughout the season and you will be able to pick some until approximately around the time that the first fall frost happens. If you live in a warmer area, it will fruit throughout the year. The berries are eaten fresh, dried, or used in cooking. This plant is self-pollinating, so you will still be able to harvest fruit if you only have room for one plant. Insects will help get the job done. You can prune the stems in the spring as needed. You may need to watch for suckers and remove them if you want to keep the plant in check. While you may see aphids or spider mites from time to time, they are generally free from pests except those like birds, deer and raccoons that munch on the fruit. You can try placing netting around the shrub to help keep the fruit safe until you have time to pick them. This plant is also generally free from any problems besides the occasional bouts of fungal diseases. Goji berries are chock full of Vitamins A, B, C, and antioxidants, as well as essential fatty acids. It has been traditionally used to treat failing eyesight and improve general health, according to our alternative medicine expert. Some feel that the antioxidants may help battle cancer.